Recordcase.de is the right place for young and old music lovers. Our broad product range covers a wide range of brands and sizes. 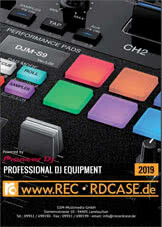 These include Sennheiser, Korg, Pioneer, Numark, Audio Technika and Vestax. If you want to buy cheap DJ equipment or boost your studio, you will find a wide range of products. Whether full professional or amateur DJ. Professional DJs, club owners, promoters, sound engineers and studio operators will find a wide range of high-quality professional equipment in our shop. And occasional DJs, bar operators or dance schools can get cheap DJ equipment at a low price. Our assortment ranges from turntables, midi controllers, headphones, LP cases, DJ bags, groove production systems to complete DJ equipment sets. An evaluation system creates transparency and helps you to classify the quality and composition of individual products. So let's go - just buy DJ equipment and start DJing right away. From Audio Technika, via Omnitronic, AKAI, Gemini and Numark to pioneers: our shop offers vinyl lovers and passionate record collectors a wide range of brands and models in different versions. Even lovers of rare 78s and shellac records won't be left out. Especially the Audio Technica and Pioneer models make the hearts of lovers of swing sounds and jazz music from the 1920s to 1940s beat faster. The next vintage party is in this sense nothing to stand in the way. For the CD lovers among the DJs, our shop offers professional DJ CD players in various sizes and versions. Our professional devices are characterized by larger control buttons, vibration-resistant drives, precise time indication or delay-free playback. This turns every CD playback into a great DJ experience - almost like a record player. Whoever works as a DJ and loves to record records knows exactly: nothing beats first-class headphones. From Sennheiser, via pioneer to premium models from Roland for the discerning professional. At recordcase. de you will find many brands and products at reasonable prices. The best record players and CD players are useless if there is no adequate mixing console. From small mixing consoles with 2 channels to multi-channel mixers. Our shop offers a wide range of professional mixing consoles from different brands in different sizes. Whether Technoclub, the small bar next door or the local hi-fi living room: you will find a suitable offer for every size in our shop. We also offer numerous spare parts such as knobs, crossfaders or line faders. Nothing is more annoying than the dust on your favorite record. If the whole thing happens while you're hanging up and disrupts the party flow, it gets really annoying. With the right protective covers and deck savers, you can contain the whole thing and don't spoil your fun. Our shop therefore also offers professional protective covers, cover plates for mixing consoles, record players, synthesizers and media players. From the smart record rack to laptop racks and professional desks, our shop offers a wide range of articles for storage, studio equipment or live setup. And who doesn't know it. They have collected and hoarded their treasures for years. Suddenly the next move is about to take place, or the partner calls again to clean up the place. So where to put the good stuff and all that electronic stuff? DJ furniture is also available at reasonable prices, which will please your yellow bag. This leaves enough money in your pocket for the next, much sought-after favourite. Also true digital professionals, techno fans or lovers of synthie pop and electronic music will not miss out on our services. From midi controllers to media players, we offer professional DJ equipment for digital professionals. Professional hardware for controlling synthesizers, sequencers or CD players enables the tuning of various interfaces and systems. So the next electric party can start. 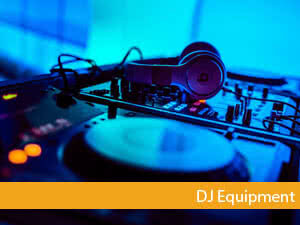 If you want to make things quick and easy, a professional DJ equipment set is a good way to equip your club or mobile DJ equipment. Whether turntable sets, a speaker bundle or just a combination of mixer and headphones. Our shop offers numerous bundles for professional DJs and demanding music lovers. This guarantees that every club or private DJ kitchen becomes a real sound paradise.